Easy tips to keep your violets blooming! Question: What does the average woman have in common with an African Violet? ...and I am right there with you! African Violets are little houseplant divas. 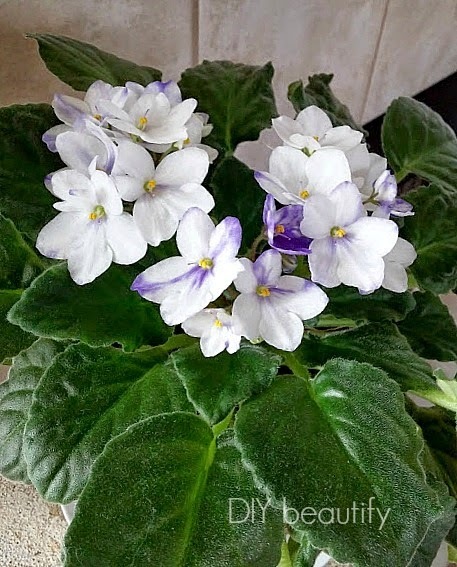 You might think they're difficult to grow, but the reality is that when they get what they like, they are very happy and the results are beautiful, healthy, gorgeous African Violets that will bloom repeatedly with very little effort on your part. I am by no means a green thumb! 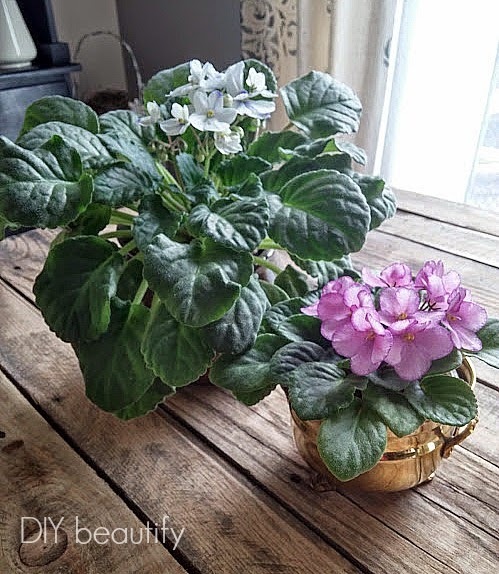 However, I have figured out two simple tricks for growing beautiful African Violet houseplants and want to share them with you. The first thing to know is that violets do not like to be watered from the top. They like to drink from their roots. And they may want a drink one day but not the next...they like to decide when and how much they'll drink! To accommodate these picky drinkers, they really need to have a proper African Violet pot...special pots just for them (I told you they were divas!). I have a large African Violet that is growing in one of these special pots and it has more than doubled in size since I planted it just over a year ago. The pots are made of two parts...an absorbent, pottery-like inner piece (which the violet is actually planted into) sitting inside of a glazed, decorative pot. You water it by lifting out the plant (ie: the inner pot) and pouring water into the outer pot and then setting the plant back down inside. The absorbent inner pot takes in water as it needs so the violet never goes thirsty. This special pot also keeps the plant from drowning (as many of us plant lovers tend to over-water our house plants and literally 'love them to death'). I've found nice African Violet pots rather difficult to find, but Amazon seems to have a good selection. I think the reason my smaller violet hasn't grown any bigger is that it's still in its original pot from Home Depot. I've been lazy and haven't found a proper pot for it yet. Seeing how big my other one has grown has motivated me to do it soon though! When they have no flowers, they love being in the spotlight (ie: bright, sunny window). Once they have flower buds, they get a little shy and want to be moved to a location with filtered light. 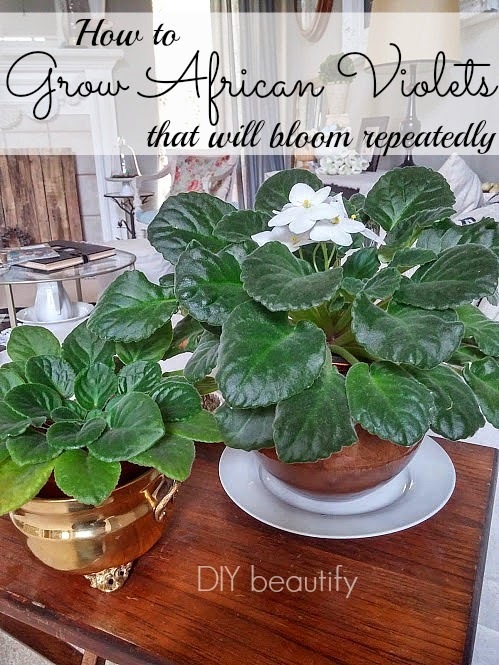 If you can remember to water them from the bottom only, and to keep them in a sunny window until you see flower buds forming, I can almost guarantee that your African Violets will be blooming for you on a regular basis too! These are such beautiful little houseplants and so easy to grow when you know these simple little tricks! Of course, houseplants like to be fed too. I use Schultz 10-15-10 concentrated Plant Food that is good for all your houseplants (just 7 drops per quart is all you need). You drip this into the water, not the soil! If you've previously been intimidated by growing African Violets, I hope you'll give them a chance!! Try my tricks and come back and let me know how they worked for you! I've had trouble with African Violets. I may just have to give them another try with your tips! My great aunts had a special table in their living room for their African Violets. I remember loving the feel of their fuzzy leaves when I went to visit. Thanks for the memory and for inspiring me to have these lovely plants in my home. Pinning! I love them, but I never can seem to get them to bloom a second time. Thanks for sharing with SYC. Do you add the liquid fertilizer to the bottom of the plant as well? Will it get absorbed? I tried it once and the fertilizer cristalized on the inner part of the pot...so I was afraid to do this again. I don't know if you'll see this but the liquid fertilizer is not added to the water! I dilute and pour on the soil, try not to touch the leaves with it! I used to have a fabulous African violet when I lived in the UK. It flowered almost constantly even though it wasn't in light (in a tiny bathroom) but I watered it from the bottom & also fed it with liquid fertilizer that I diluted in the watering liquid. The roots will then absorb the fertilizer gradually, just as it's drinking normally. This will stop it from getting a heavy food shock .. (a little like us after a huge Christmas dinner) ... The fertilier crystalizing sounds as though it may be getting too much fertilizer in a single dose. Often people think that more is better ... but this isn't always the case. Cheers & thanks again .. Wendy from Oz. Thanks for your comment Wendy, good luck growing your violets! When you say to put these in a sunny window when there are no flowers, are you talking about direct sun? Yes when you are trying to encourage flowering, direct sun is fine! Just make sure they always have water and as soon as you see buds, move them to filtered light.